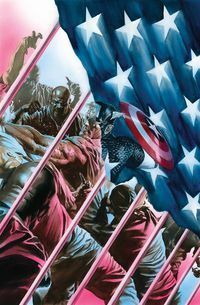 Whether you're reading about Sam Wilson or Steve Rogers, each issue of Captain America is packed full of action, political intrigue, and character development. With Secret Empire now in full swing, the Captain America books are integral reading for any Marvel Universe fan. Not only do we have the newest Captain America comics and a wide selection of Captain America graphic novels, but we also have the hottest Captain America action figures and apparel. Captain America Sam Wilson Begins Here! Legal Notice: Entire contents trademarked (® or TM) and copyrighted (©) 1986-2019 by Things From Another World, Inc. and respective copyright and trademark holders. All rights reserved. Page rendered at 2019-04-19 07:30:49 in 0.541 seconds.